Probably one of the most difficult times in the months following the loss of a loved one is the Christmas season. For many years families served by the Crain Funeral Homes have received a special gift to help them through their loss during the season. 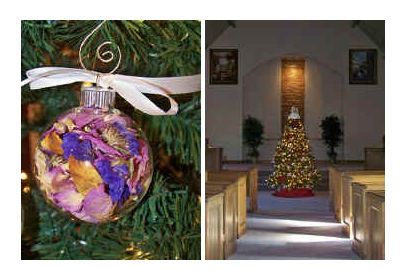 A personalized, handcrafted floral ornament is made by the Crain family for each family served during the past year. The clear glass ornaments are filled with flower petals that the Crains have dried from a handful of flowers gathered after each service. "Using actual flowers from the service personalizes the ornament making it a meaningful keepsake for the family to treasure for years to come" explains Bryan Crain. Crafting the ornaments is a year round project involving the whole family. Bryan's aunt, Sharon Crain, perfected the drying of the flowers so they will maintain their bright colors. Each ornament is created painstakingly one petal at a time, making this truly a labor of love.